Organizing businesses and individuals since 1994! Morgan Organizers expertly creates the organization you crave, allowing you to breathe easier and enjoy life more. Our goal is to eliminate chaos and stress from your life and bring order to it instead with our astute eye for detail. You can have complete peace of mind knowing that we’re fully insured and background checked. We truly enjoy what we do, and our passion stems from the smile we put on your face when you walk into your newly organized home or office! We offer an array of services to help anyone and everyone get a handle on their life—from seniors, busy professionals, and stay-at-home-parents to those who are experiencing a variety of life transitions. Whether you need help with office or home management, with moving, or with your finances, Morgan Organizers is your single stop for checking off all the daunting items on your seemingly endless to-do list. No job is too big or too small. Working with Michèle Morgan of Morgan Organizers is absolutely wonderful. Within a very short period of time, she provides you the right tools to help you get started and stay organized. Her approach is very flexible to the needs of her clients. Thank you Morgan Organizers for bringing peace and calm back into my life. 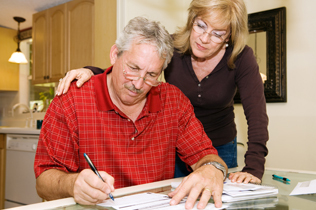 We help seniors plan and accomplish downsizing and transitioning to assisted or independent living. As experienced Senior Move Managers and can work with your aging relatives to help them make the adjustment to their new home. We can take care of all of your day-to-day financial tasks, such as reconciling bank accounts, preparing and making deposits, fiscal year-end organization, and notary services. We efficiently attend to all the “paperwork” in your life, including setting up and managing QuickBooks accounts, sorting mail, reviewing/paying bills, organizing taxes, and creating and maintaining a budget. We help time-crunched people get and stay organized, with the end result of making their lives function with ease. We coordinate cleaning things out, organizing details of an estate sale, and more. We assist people with any type of relocation, whether they’re selling a home, moving to a new one, or buying a second residence. Planning a visit to your beach home? We can prepare it for your arrival. We create a seamless workflow to maximize your productivity for both home and office. I am pleased to announce my affiliation with the National Association of Senior Advocates (NAOSA). NAOSA was founded to protect our senior population from unethical business practices, scams and businesses who attempt to target and take advantage of not only seniors, but all consumers. Please visit their web-site at www.naosa.org for more information. Be sure to also check out the free consumer membership that features the NAOSA Scam Alert, a free service that will notify you of any scams reported in your area. 2019 Morgan Organizers. All Rights Reserved.